May the Wind be Always at your back…. Take 5 people, average age 62, average fitness , 5 bikes and a old railway line. 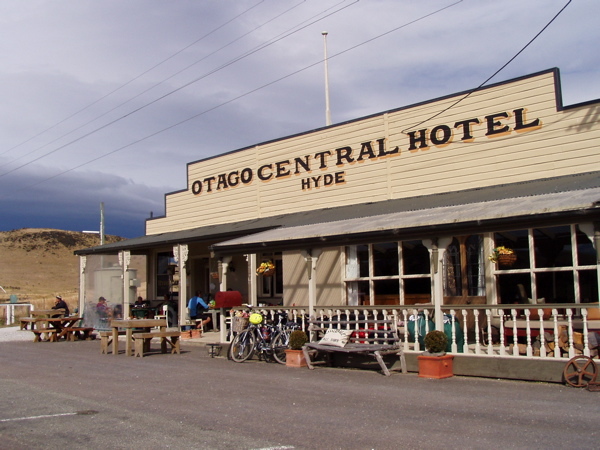 Mix in the classic gold and barren landscape of central Otago, some country pubs and mellow autumn sun, and you are in for a great ride – The Otago Rail Trail. It was great – but definately more than we bargained for. The trip started well. Five of us met up in Christchurch – David and Pamela waiting at the airport in their magnificently equipped camper van, when Ceridwyn, Danielle and Rosemary flew in. We drove across the seemingly endless flat Canterbury plains before a stop at Temuka for coffee and the maps came out to plan the next stop. 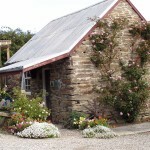 We headed for Moeraki and decided to stay there. A good decision as it meant we could visit the Moeraki Boulders, those strangely rounded rocks along the beach, full of ancient mystery. 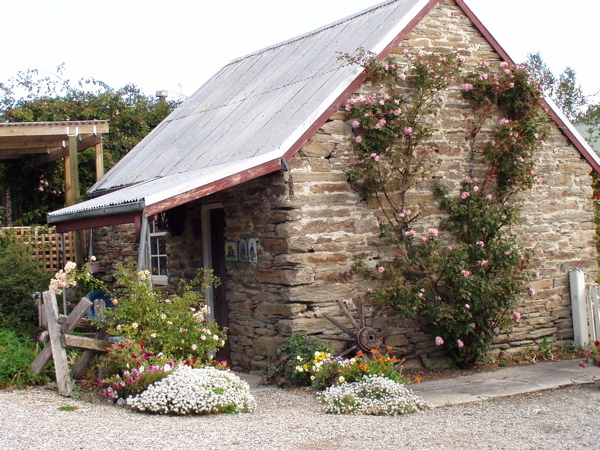 It also gave us a chance to have a memorable meal at the award winning Fleurs Place – right on the wharf at Moeraki. 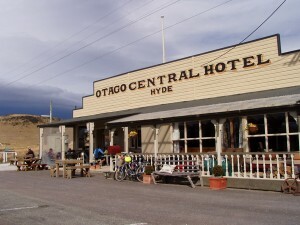 Next day was the Pig Route, as it is affectionately named, winding up to Macrae’s – a very impressive open cast mine, then on to Hyde where we enjoyed a great cup of coffee while we waited to meet up with our bikes. The bikes duly arrived, a little practice to adjust seats, put on the helmets for the ‘before’ photo, and off along the curving riverside track, in pale sunshine and high spirits. Ceri, Danielle, Pamela and I felt triumphant to reach our first stop, Daisybank, where David had morning tea ready in the van. We were exhilarated by the first leg of our ride, but we were cold. It was hard to leave the warm van. By the time we biked resolutely to Waipiata, the rain had started. It was hinting at being cold enough to snow. This was not what we had expected at all. 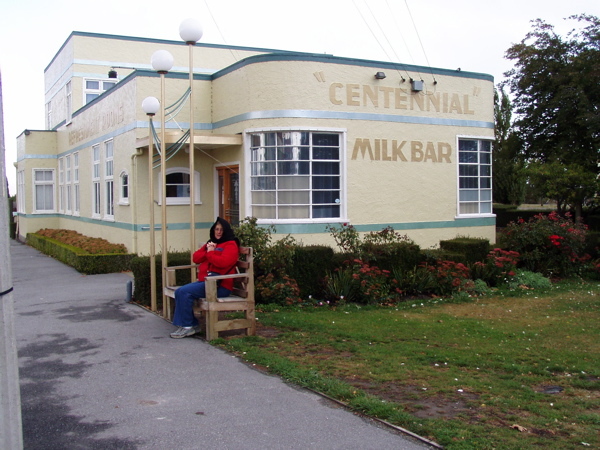 It was 2pm and the Pub at Waipiata had just opened. We spread our clothes on the rack by the roaring fire, only to move them along as each wave of semi-frozen riders tumbled in the door. Hot coffee, warm room, heaven. A little too much like heaven. Only Ceridwyn and Pamela decided to brave the rain/sleet for the next part of the trip to Ranfurly. It was snowing as they slid into town – we booked into to the Art Deco Ranfurly Hotel for the night. 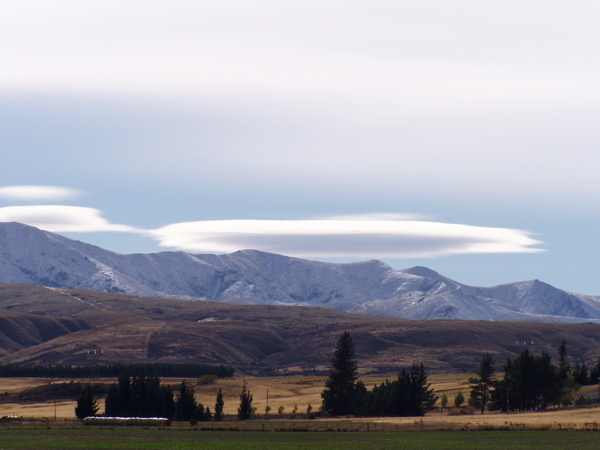 Day two – the Lammermoor Peaks white in the distance, cold southerly wind and more snow forecast. An early start to try and beat the weather. Down to 3 of us – after yesterday’s cold ride Pamela decided to keep David company in the van. Not a bad decision as it turned out. 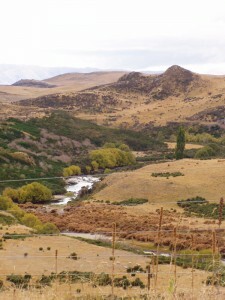 It was 13 kms to Wedderburn – slightly uphill into a bitterly cold wind across the vast Maniototo plains. Very hard work – mostly in 1st-3rd gear all the way. I was very thankful that I had packed my long johns and thermals, and was very envious of those travelling towards us with balaclavas under their helmets. What a relief to see the buildings of Wedderburn. A brief stop for coffee in the seductively warm van. Only Ceridwyn decided to pedal on into the wind alone. 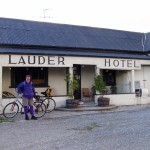 I joined Ceridwyn after the summit and we then experienced the joy of the downhill to Oturehua. We left our bikes there in the shed behind the shop, and decided to go back to explore Naseby. On the way we came across Whiskery Bills – an old hostelry just off the track which owner Shelly had bought in a derelict state and done up for food and accommodation. We had some great coffee in front of a warm fire and a huge BLAT sandwich and soup. A highly recommended food stop on the trail. 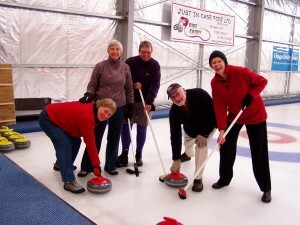 Naseby is a beautiful old town with great pubs (they are everywhere here) and an international Curling rink. We could not resist – Fred taught us how and we were off with a North island vs South Island competition. Great fun – but rug up – it’s cold in there! 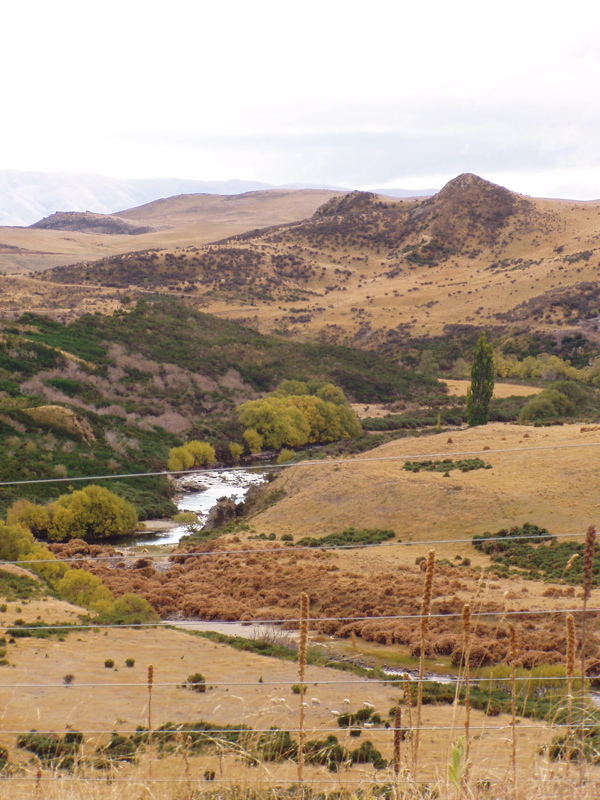 Day three – snow on the ground in Ranfurly and it was bitterly cold. The locals recommended a day off riding and we happily took that advice and took off to explore the area by car and foot. We did not take much convincing. Firstly we did the Art Deco shops in Ranfurly and the excellent information centre in the old railway station, where we learnt more of the story of the economic ups and downs of this area as the trains stopped coming, and the area struggled to survive. Ranfurly has re-invented itself as an Art Deco town. The opening of the Rail Trail has brought a lot of new life and economic growth to the area as old hotels have been renovated, backpackers opened, and cafes, restaurants and shops have opened up. 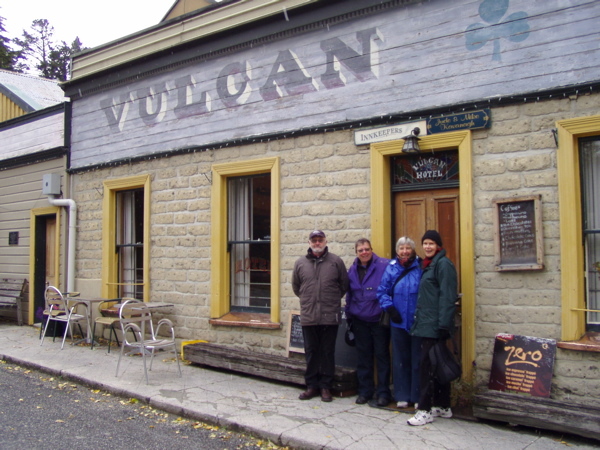 We drove up to St Bathans where much to our delight it was still snowing – we enjoyed a few games of pool and had hot soup and toasted sandwiches by the fire in the hotel. We discovered the amazing landscape of nature-carved sandstone at the Blue Lake before heading off to the small village of Ophir with its historic buildings and beautiful bridge. Ceri walked the 2kms back to Omakau where we found a shop that sold gel seats for the bikes (they sold quickly) and some hats to keep our ears warm. The fantastic old buildings are amazing – built of stone, or wood or plaster, they looked one with the earth, and some of them were in danger of returning to it. The whole area oozes charm and story. Sun at last on Day four. Ceri and I mounted up and headed to Lauder to wait for the others. 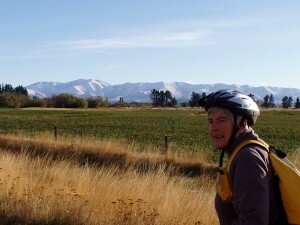 We met an older woman who had gone to school at Little Ida Valley She told us that while the locals were dubious at first about whether anybody would cycle the rail trail, most now saw it as a very positive thing and were glad to welcome out of towners to enjoy it. In fact she invited us to a cuppa if ever we were up her way. 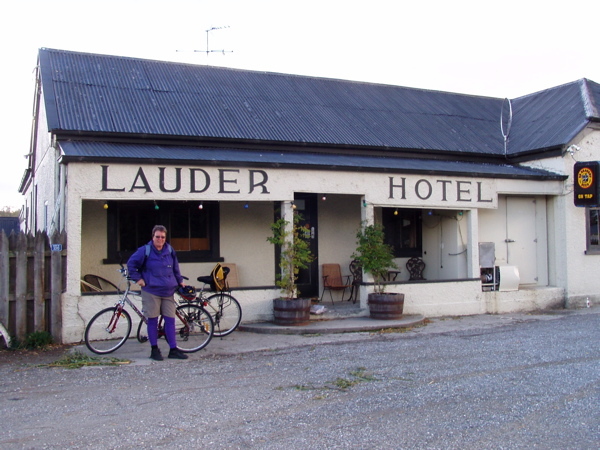 At Lauder a small caravan which looked like a train was parked up by the trail doing espresso coffee – a very welcome stop for most riders as nothing else was open in Lauder at that time. 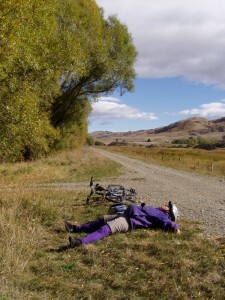 The trail from Lauder to Oturehua is described as one of the most scenic parts of the trail with its tunnels and bridges – it was an awesome ride through the gorge, following the Idaburn stream. It is also one of the longest stretches of the trail, and the last section was long and straight, and despite a tail wind picking up, my legs were jelly by the time we arrived. Only Ceridwyn rode the last stretch into Clyde which she reported was a beautiful ride along the river under gold and red autumn trees – although by the time she met us it was dark and difficult to see anything. Our last night stay was at the genteel Dunstan House – a magnficently restored B&B where we stayed in the Fleur Sullivan room – complete with claw bath. 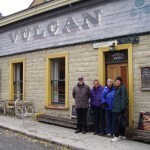 Fleur at age 28 had bought the old hotel in Clyde for 4,000 pounds and began restoring it. Fleur also started Olivers – the restaurant across the road. So we could not resist finishing our trip the way we had started – in style with a beautiful meal at Olivers, thinking of Fleur Sullivan and the people like her who had believed in and loved this area and been a part of opening it up to people like us to enjoy. Explore the Otago Rail Trail – I would love to do it again – we only scratched the surface of this magnificent area. 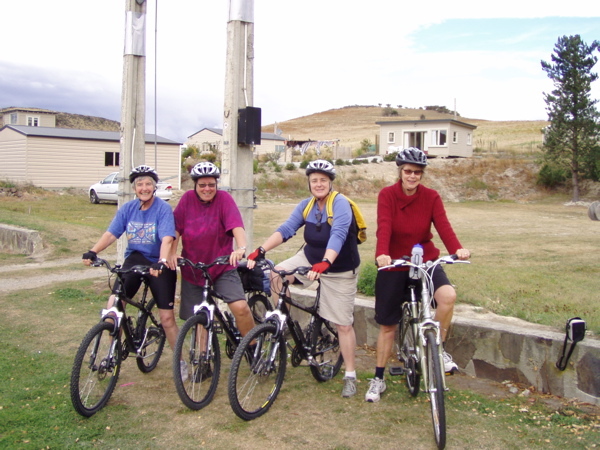 All sorts of people do it – all shapes, sizes, ages – its great fun and not that hard to cycle 30 kms a day!